A small garden often poses a greater challenge to the gardener than a large one. Faced with limited space, it can be difficult to now what to plant and how to make sure that your plants grow well. Good advice and careful planning is essential. The wrong tree or shrub can result in broken drains or damaged foundations. A tree that grows too large can block sunlight, compromise views and irritate neighbours. A plant that thrives in a more open space might require quite different treatment in a small setting. Landscaping decisions can make a difference between a cramped hard-to-maintain garden and one that is welcoming in every season. 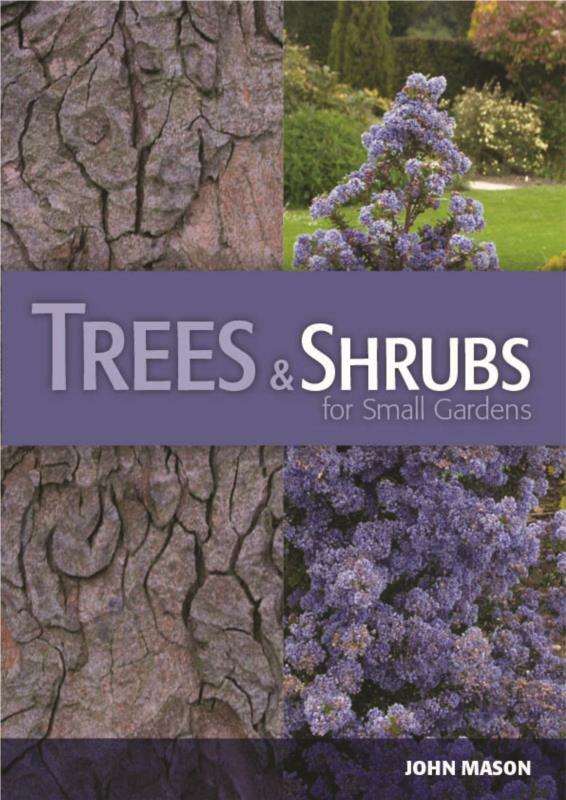 an inspirational directory of hundreds of trees and shrubs suited to cultivation in small areas. This book is an essential guide for any gardener who wants to make the most of a small garden, balcony, verandah or courtyard. It’s easy to grow whatever you want on a big property; but a small garden is more of a challenge. The plants need to be selected more carefully, and perhaps be treated in a different way. You might need to prune them more often, or do something to restrict the roots from becoming invasive (eg. damaging pipes or paving). This book is relevant to any type of small garden; from the tiny backyards of small inner city properties, to courtyard gardens of villa units or even small areas on larger properties. People who have quarter acre blocks or even acreage, can often have difficult areas such as an enclosed courtyard, or a narrow strip between the house and a neighbouring property. Any small place offers unique challenges when you come to select, use and care for plants. If any of this sounds familiar to you; this book will be a wealth of information. Scent from strongly scented plants will not escape so readily in an enclosed garden. (this can allow plants that might be cold sensitive in your area, to be grown easier; but it can also increase the requirement those plants have for watering). Enclosed spaces are often poorly ventilated; and that can result in greater humidity and lower levels of carbon dioxide than what a more open garden might experience (these things can put stress on the health of some plants). In a smaller area, every square metre gets more intensive use, and that can mean such things as more damage by pets and increased soil compaction from people. Prickly or poisonous plants are more likely to be brushed in a confined area. Falling leaves, flowers or fruits are more likely to get to places where you do not want them. The density of foliage is more likely to impact upon light levels and ventilation. Sometimes the roots of some smaller plants may be more damaging than those of larger plants. Any plant will always grow differently in different places. Most trees and shrubs will grow slower and smaller in colder climates; so often something that might be inappropriate for a small garden in a mild temperate climate; might be acceptable in a cold temperate climate. If you have a favourite tree or shrub, but don’t have the space to grow it; all hope is not lost. There are often ways of treating plants to accommodate the space restrictions you confront. You might grow it in a tub; or just prune it to restrict its’ size. If the roots pose a problem, you might plant it in a confined position; where the root system is restricted form getting too large. Trees that might ordinarily be too big for a small garden may still be able to be grown, using a technique to restrict the plant’s size. The most obvious way is to grow the tree in a tub; or to restrict the spread of roots or foliage by pruning. Many larger plants can be readily kept much smaller in this manner, for example as hedges, or as topiary specimens, or even as bonsai. Woven fabrics that restrict movement of roots (eg. root control bags). Thin plastic or metal barriers placed vertically down into the ground to prevent roots spreading outwards from the plant into areas where the they might be a problem (e.g. pipes, water features, paved areas). If the barrier reaches deep enough (ideally at least 50 - 60cm or more) then any roots that do go beneath the barrier are usually deep enough not to cause problems for paved areas. Although there are many naturally weeping plants, some weeping trees are produced by grafting. Generally a tall upright growing variety forms the rootstock, and a spreading variety is grafted on top, at a desired height. This produces a straight upright trunk supporting outstretched and drooping branches on top. The height of weeping trees can be controlled (hence many have potential for smaller gardens). Be aware that some weeping trees can still spread a great deal, and become quite large. Weeping elms for instance might be inappropriate for a courtyard, but a weeping Acer palmatum ‘Dissectum’ may be appropriate. Prostrate Grevilleas (e.g. G. ‘Royal Mantle’, G. ‘Gaudi Chaudi’, G. thelmaniana). Standards are often developed by grafting an upright or bushy styled plant onto a more erect cultivar of the same plant genus. Alternatively a normal plant can sometimes be trained, through careful pruning to achieve the same standard habit. The desired plant is allowed to grow as a single stem until the height is achieved where you desire branching (the ball shape) is to commence. At this point the plant is pruned. Pruning is continuous from this point onwards in order to achieve a bushy well-branched specimen. Any branches that develop below the desired point are removed immediately. The height of the standard and the size of the ball are purely subjective. In other words, you can select any dimension you desire. Many small shrubs and trees are suitable for standards. The bushier the natural habit of the plant tends to be, the better suited to standard formation the plant generally is. The spread of larger plants can often be contained by growing them as espaliers. This is the process of growing a plant up a wall or trellis, or similar structure, with the plant trained and pruned against the flat structure minimising its spread outwards. This can be a great way of utilising what might otherwise be a bare wall, and allow you to grow plants that might otherwise be to big. Trellising or wire stays might be used against the wall to provide anchorage points to train branches too. If you liked this you might also be interested in our tree courses with ACS Distance Educations Online Courses here.